Nonduality is the term we use to label the examination and exploration of oneness. “Non” means “no” and “duality” means “more than one,” so this is the philosophy of not-more-than-one. There is “just one thing going on”. Everybody and everything are part of this one thing. Nonduality takes the Golden Rule one step further. It’s not telling you to treat others as you would have them treat you, but rather that as you treat others, so are you treating yourself. There is no room for accidents in this kind of spontaneously arising environment. It’s such an extraordinary concept that the mind cannot hold it; it can only behold it. It is this very beholding that was experienced by Jesus, Buddha, Rumi, St. Francis, St. John of the Cross, St. Teresa of Avila, Mahatma Gandhi, Mother Teresa, and many more of whom the average person has never heard. It’s my educated guess that more awakened people are living on the planet today than have lived on it in all the previous years combined. For thousands of years, Nondual awakening was an extraordinary and isolated event. Percentagewise, it’s still unusual for someone to come to a deep and ongoing spiritual awakening, but glimpses of reality—clear seeings which can forever alter our lives—are simply no longer rare. The effectiveness of Nondual teachings is measurable. Under the guidance of an awakened teacher, no matter what the tradition, or lack of tradition, we will come to self-realization, and/or we will see others do so, or we don’t. If awakening isn’t happening, it’s simply not the real thing. You will know it by its fruits. I know of no other set of spiritual teachings in which success or failure is so clear, evident, and public. You’re surely going to be hearing more and more about oneness teachings in coming years as they quietly spread like an ocean of dye while making their way both around the globe, and around your block. Wherever they reach, there is marked change. Once we enter the stream of this teaching we don’t need science to convince us of anything, but it’s nonetheless interesting to note that many branches of science, from quantum physics to advanced neurology, are pointing to many of the same conclusions advanced by Nondual teachings. We find striking similarities—or mirrors—in quantum physics, cutting edge neuroscience, computer science, biology, and more. Even if you have never heard of Nonduality, it doesn’t matter. That might even work for you, simply because you won’t have to unlearn or overcome a bunch of intellectual knowledge about it. Such knowledge can be very helpful, particularly at the beginning, but if we don’t stand upon it and reach beyond it, then it can become a hindrance. I have seen two men, neither of whom had even heard the word “Nonduality,” come to an awakening as we were going through an investigation together. They didn’t need background. I have also seen people who’ve followed this path for years become so steeped in their own ideas about truth that they have become resistant to truth itself. We become too right and too smart to wake up—at least until the fact that we don’t forces us to change our path. Nondual awakening is what has traditionally been referred to as “enlightenment.” All of this is explained in more depth below. Suffice to say, awakening is real, and the truth can be realized by ordinary people without any sort of deprivation or renouncement. One way to do that, the quickest way that I know, is through the Direct Pointing Method that I share and write about. 2 – What is awakening? Awakening is actually something of a misnomer. What we’re speaking of is simply the recognition of your true nature–seeing/being that which you already are. As explained in FAQ 1, there is just “one thing going on,” and awakening is the seeing of this truth for ourselves. We no longer have to rely on hearsay or second-hand information. We may not yet be clear, but we know a deep truth that we can never fully un-know. When this occurs it tends to feel like an awakening from a dream. However, what is ‘experienced’ is that which is always already awake–which in fact never was asleep to begin with. The easiest way to put this is to say that it’s not the ego which awakens, but rather Life itself which awakens from the dream of exclusive identification. In short, we see that what we are includes the body (and everything else! ), but that our true nature is not limited to the body. This is not something we can figure out; it has to be seen directly for ourselves. This seeing can come as a glimpse, or as a full seeing–with a whimper, a bang, or anything in between. Awakening can seem to come quickly, or slowly. Most often it’s a combination. It may appear to require special spiritual practices, or be shown to completely transcend them. It can and does happen any way it wants to, any time it wants to, through any body it wants to. Any attempt to explain what awakening really is, including this one, will ultimately fail. That which is always already awake is also that which is beyond words. Still, we try! The personality–the one looking to wake up, get enlightened, find liberation–whatever you want to call it–will never actually awaken. The personality, the character of the so-called individual, and hence that entire play, is precisely what is seen through. In the absence of a personal me, reality is shown to be spontaneously arising. It’s right here, right now: nowhere and nowhen else. This is it, but it’s so close, so obvious, so incredible that we can’t see it. Until we do. Once we do, if it’s thoroughly seen, we can see nothing else. Our story is like clouds in front of the sun. In the presence of clouds, the sun is shining, but it isn’t seen. In the absence of clouds, the sun is seen, but the clouds never actually affected either the sun or its shining. In the absence of story, only truth remains. 3 – What can I do to help myself wake up? If you mean, what can the non-existent character do to bring about a change in its hypothetical sleep state–well you see it right there in the words “non-existent” and “hypothetical.” In the end there’s nothing we can do, not directly. However, don’t despair. While it’s true that from the absolute view there is “nothing to do and no one to do it,” that’s just a view. It feels like the whole, but it’s really just half; it’s 180 degrees of seeing out of a possible 360 to be experienced. It could be said that taking this fatalistic viewpoint is tantamount to absolutely denying the existence of the relative, which happens a lot, especially with glimpses, or less than full awakenings, which are by far the most common sort. After spending most of our lives identifying as the relative, we get a glimpse of the absolute and completely shift our loyalties–to the other side of limitation! First I thought I was Fred. Then, after a true seeing, I thought I was Not-Fred. Now, I know I’m both. If we embrace this “I am the vastness and only the vastness” limitation after our own experience, or borrow it from others, then our view remains incorrect, but in a wholly new way. Now we get to suffer from a higher level! The true Nondual view, the 360, as I call it, denies nothing. Nonduality means that there’s just one thing going on; how can we deny any part of it? The absolute and relative, the real and unreal, the permanent and temporary are all just halves, which is the tip-off that, although our view may have significantly broadened or deepened, we’re still seeing from duality. 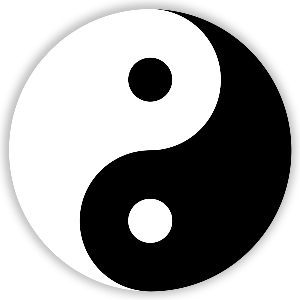 Neither yin nor yang is true or complete, but the pairing of the two is both true and complete, so to speak. Let me add that there are fully awake teachers who employ this “no-method method” as a teaching strategy. That’s their story and they’re sticking to it. I get it. When this strategy works, it works well, but it only seems to work with a fairly narrow band of seekers. My teaching is based the Law of Large Numbers: how do the most people wake up most of the time? Let’s do that! Regardless of what we may see, know, and experience from that absolute view, there is nonetheless a body still here on a planet we call Earth, and it’s still going to want lunch and a nap. We can, in essence, enlist the dream character to work within the dream toward the apparent goal of awakening, and to carry out skillful living in the relative world. From a higher view it could be said to all be part of a spontaneously unfolding script, and that’s fine. None of this makes any logical sense. If we insist on putting everything into neat, logical boxes, then we are lost, because at that point even doing nothing is seen as a practice! Again, this is not something we can figure out. We have to experience it first-hand. This is what Direct Pointing is all about. 4 – Do I have free will, or not? Neither. Both. Actually, it’s a moot question. Once again, this has to be looked at from the larger picture. Once we enter Nonduality, we have left the land of easy answers and entered the land of difficult questions. Who is it that is supposed to either have free will, or not have free will? Ah, yes, we’re right back to our old friend, the imaginary character! Answer in the negative, and we’re saying that no, I as a separate being do not have free will. Answer in the positive, and we are stating that yes, I as a separate being do have free will. The trap is successfully sprung either way we go. This is precisely the kind of question that human minds love to get involved with because we can take a stand and battle over it forever. In fact, we have already done so: clerics and philosophers have had an ongoing argument over this for several thousand years. We’re just the latest generation to address it. Ego delights in all of this, because it gets to keep churning along no matter which side has the temporary upper hand. All ego needs to survive is resistance in any form, which is why war in its ten thousand costumes is the single most common phenomenon on our planet. Nonduality is not declaring that you do not have free will. Nonduality is not declaring that you do have free will. Nonduality is declaring that you, as a separate entity, do not exist. 5 – How do I stay awake? Very well, my used-to-be-enlightened friend. Then let me ask you a few more questions that you don’t even need to answer. I really hate to do this, but I have no choice. Who is it that has lost the connection? Who is it that feels like it has “fallen out,” or become “disconnected” from the one thing going on? It couldn’t be that imaginary character creeping back into the picture, could it? Of course it is. Not every question that arises in Nondual teachings comes back to this one question, but damn near every one of them does. One more quick note here. The chief reason we feel like we’ve lost “our connection” is that we’ve lost our buzz. Humans are hooked up to love their buzzes. Sometimes the apparent penetration of reality is accompanied by waves of energy, blissful highs, hallucinations (which we call visions), and any amount and variety of fireworks and candy. We confuse that with the awakening. We confuse the bugle with the sunrise, and we happen to like the bugle a lot. And who is it that likes the bugle? You tell me. But does the bugle actually have anything to do with the sunrise? Is it causation, or is it accompaniment? The answer is clear. Having said all of that, let me end this by saying that there are things we can do to encourage stable awakeness, so there is no reason for despair. 6 – Is there really a planetary shift taking place? Apparently so, although there’s no hard evidence of it. There certainly appears to be a dramatic increase in the number of awakenings that are taking place, particularly in the number of initial penetrations, either glimpses, or more prolonged seeings, that are occurring. For thousands of years we believed awakening was a rarity. While we certainly can’t know how many men and women woke up historically, the records we have received concerning saints, mystics, and those who seem to have been “Nondual heretics” indicate that it was extremely rare. Granted, in the West, few would have been very keen to “come out of the closet,” what with a stoning or stake burning awaiting them, so the records are less than infallible. But in the East, where such things have long been more culturally acceptable, reports of authentic awakening have never been abundant. I offer here my own version of what I think is happening in this era in my country (and the story is similar elsewhere), how I see it occurring, and why I think it’s taking place now, particularly in America. While many Nondual principles have been studied and debated by Western philosophers since the time of Socrates, it was in the East that the experiencing of them was turned into an art. Yet for a long, long time the East was a relatively closed area—to Westerners, I mean! In the Nineteenth and Twentieth Centuries, as both local and world travel became more common, Nondual teachings could move more easily, and they began to come out of hiding. America had its Transcendentalists–Emerson, Thoreau, Whitman, John Muir, et al. The Indian saint, Sri Vivekananda came to the West at the close of the nineteenth century. This was a game changer because he presented his views at the World Parliament of Religions in 1893, which gave the teachings widespread fame for the first time outside India. Beginning in the 1920s D. T. Suzuki (with a little promotional help from Carl Jung) brought Zen teachings from Japan, and a decade later Paul Brunton introduced the world to Ramana Maharshi via his book, A Search in Secret India. In the 1950s, after China swallowed up Tibet, the long-secret teachings of Tibetan religious orders began to emerge as their practitioners fled to the West. By the 1960s and 1970s there was a flood of information moving West, and a river of spiritual seekers moving East. All of this was the foundation for the detonation to come. In this century, with the rise of the Internet, the teaching found an easy way to spread, a comfortable place to call home. It was a perfect marriage of information and utilitym, and Nonduality exploded. Long-hidden teachings were suddenly just a click away. The most obscure volumes could now be easily discovered on Amazon.com. And people began to wake up–lots of them by any historical standard–and, though it’s a brief penetration for many, that glimpse is often enough to change the life of the seer. Simultaneously, the health of our planet has grown more and more dire. Of course the planet itself is in no danger, but its living species are, including humans. While America is not the only culprit, we remain the shining example. We are the poster nation for a world of self-centered culprits. Everyone in the world now wants two cars and a McMansion. Everyone wants cheap, abundant electricity, so much water that they can waste it, and all the fossil fuels they can burn. Everyone wants to eat meat two or three times a day and throw their garbage in burgeoning landfills. We have just a few generations to solve these enormous, fundamental planetary problems, or the planet will solve them for us, and we won’t like the fix. Probably the only way out of this danger is through a fundamental change in human behavior, which is only possible if enough people wake up. There is nothing so inspiring as self-interest, and once it is seen widely enough that there is just one thing going on, then all interest is Self-interest. There is only looking out for number one, and that’s only achieved by looking out for everyone and everything. Not everyone has to wake up in order to achieve this, but it will take a significant number. Assuming that’s what’s happening now, then at some point the weight of all these enlightened people will tip the scales toward rational living and rational governing. The rest will follow: they always do. From an absolute view, none of this matters much. I find that view cold and pointless, and I don’t find it enlightened. It does not inspire skillful thinking or skillful action. There is a story about a Zen master, Shunryu Suzuki. When he was on his deathbed in California, a friend brought him some tea. When Suzuki swooned a bit, the friend jerked to help him, and the tea cup she was carrying careened toward the floor. “Watch out for the cup!” Suzuki hollered. “But Roshi (teacher), I was trying to take care of you,” said the friend. “Taking care of the cup is taking care of me,” Suzuki replied.